Victor Hugo (1802-1885) Best-selling author of The Hunchback of Notre-Dame (1831) and Les Misérables (1862), Hugo had spent the Second Empire period (1852-70) in exile in Jersey. Now he returned to be elected a member of the National Assembly, make impassioned speeches, write windy pamphlets and publish bombastic poems. When the Commune was declared, he wisely went back into exile (in Brussels) where he wrote the moving poem, Sur une barricade, on June 11, 1871. Honoré Daumier (1808-79) Satirical cartoonist under the Second Empire, Daumier stayed in Paris throughout the siege and continued to publish bitter and highly political images. He was drafted onto Courbet’s Federation of Artists in September 1870, then onto the Commune’s Committee of Artists in April 1871, though never a Communard. Théophile Gautier (1811–1872) An established poet and critic, Gautier made his way back to Paris upon hearing of the Prussian advance on the capital. He remained with his family there throughout the invasion and the aftermath of the Commune. Jean Désiré Gustave Courbet (1819-77) A notorious radical and freethinker, Courbet was the hugely influential ‘Father of Realism’ in Art in France. He established a Federation of Artists when the Empire fell, and went on to set up a Committee of Artists under the Commune. Although he managed to save Paris’ art museums from looting mobs, Courbet was a moving force behind demolishing the Vendôme Column in the square of the same name. Once the Commune was crushed, Courbet was sentenced in September 1871 to six months in prison and a fine of 500 francs. When it was proposed to recreate the Vendôme Column Courbet was condemned to pay the exorbitant costs. He fled to Switzerland where he continued to paint, and died of liver disease just as the cost of the re-erection was settled as 323,091 francs. Surprisingly, he didn’t leave any paintings or sketches of the war or Commune. Gustave Flaubert (1821-80) The most famous literary novelist of his day, during the Franco-Prussian War Flaubert’s home was occupied by Prussian soldiers and he suffered a nervous breakdown. Maxime du Camp (1822–1894) Literary journalist and travel writer, du Camp was elected a member of the French Academy in 1880 mainly due to his history of the Commune, Les Convulsions de Paris (1878–1880). César-Auguste-Jean-Guillaume-Hubert Franck (1822–1890) Organist and composer, Franck and his family suffered during the siege and Commune. Afterwards he was a leader of the movement to create a truly French art, an Ars Gallica which explains the tone of much of his music. In part this was a patriotic reaction against the heaviness of the music of the invader. Camille Pissarro (1830–1903) At the outbreak of war the painter Pissarro moved his family to Norwood, then a village on the southern edge of London. His early impressionist style did not do well but he met the Paris art dealer Paul Durand-Ruel in London, who helped sell his art for the rest of his life. Durand-Ruel put him in touch with Monet, who was also in London during this period. Monet and Pissarro both went to see the work of British landscape artists John Constable and J. M. W. Turner, which confirmed their belief that their style of open air painting gave the truest depiction of light and atmosphere, an effect that couldn’t be achieved in the studio alone. 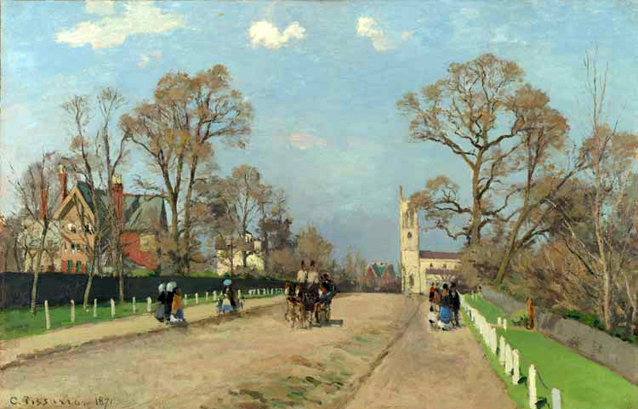 During his stay Pissarro painted scenes at Sydenham and Norwood at a time when they were semi-rural and had only just been connected to London by railways. Twelve oil paintings date from his stay including The Avenue, Sydenham (now in the London National Gallery), Norwood Under the Snow, and Lordship Lane Station. Pissarro is often credited with inventing Impressionism – the rough use of paint to capture plein air affects. He had produced some 1,500 paintings over the preceding 20 years, works which amounted to documentary evidence of the birth of Impressionism. But, tragically, when he returned to France after the Commune, Pissarro discovered that out of this huge oeuvre, only 40 had survived! The rest had been damaged or destroyed by the soldiers, who used them, among other things, as door mats or to wipe their boots with. Back in Paris Pissarro got back in contact with the other artists of his generation – Cézanne, Monet, Manet, Renoir and Degas – and helped establish a collective called the ‘Société Anonyme des Artistes, Peintres, Sculpteurs et Graveurs’. In 1874 Pissarro was the driving force behind the group’s first Exhibition, at which the critics ridiculed them for their ‘impressionism’ – and the name stuck. Edouard Manet (1832-83) Godfather of the Impressionists, the thirty-eight-year-old Manet was in Paris during the Prussian siege and conscripted to be a member of the National Guard. As soon as the siege ended (in January 1871) he left town. In his absence his friends added his name to the ‘Fédération des artistes’ of the Paris Commune but he stayed away from Paris until after the semaine sanglante. 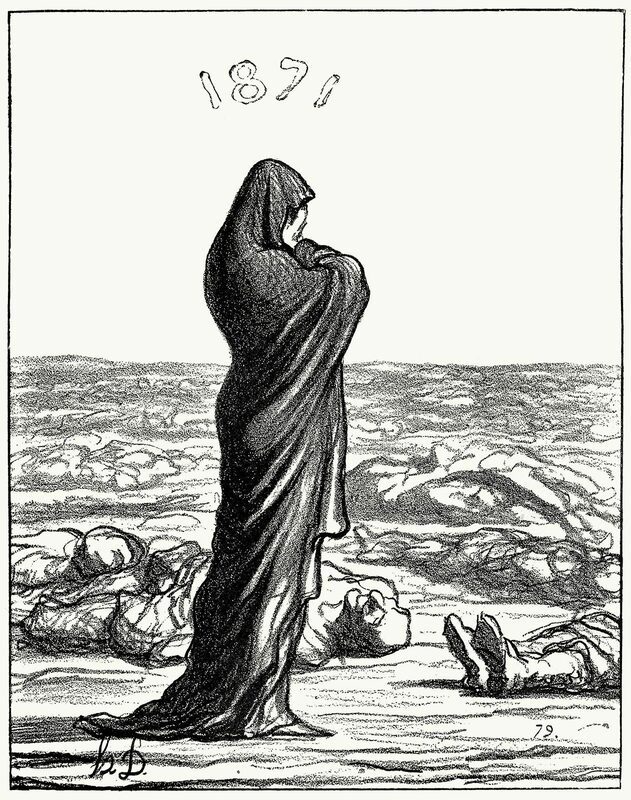 He published some harrowing sketches of scenes from the war. Edgar Dégas (1834–1917) At the outbreak of the War Dégas enlisted in the National Guard, where his duties left him little time for painting. Charles-Camille Saint-Saëns (1835–1921) The organist and composer Saint-Saëns was relieved from fighting duty as a favourite of a relative of the Emperor Napoleon III. He fled to London when the Commune took power, as his fame and Society connections made him a possible target. Later that year he co-founded with Romain Bussine the ‘Société Nationale de Musique’ to promote a new and specifically French music. After the fall of the Commune, the Society premiered works by Fauré, César Franck, Édouard Lalo and Saint-Saëns himself, who became a powerful figure in shaping the future of French music. Émile Zola (1840-92) Father of literary Realism, Zola published his only historical novel, Le Debacle, about the war, in 1892. François-Auguste-René Rodin (1840–1917) When the war started Rodin was called up for the National Guard but he was soon released due to his near-sightedness. At the time he was working as a decorative sculptor and, as work dwindled due to the war, he took up an offer of work in Belgium where he lived for the next six years. None of his work refers directly to either the war or Commune. Claude Monet (1840-1926) On the outbreak of the war Monet and his friend Pissarro fled to England. While there he studied the work of Constable and Turner and met the art dealer Durand-Ruel, who was to become one of the great champions of the Impressionists. After the Commune had been suppressed (May 1871) Monet went to Holland for a spell, and then returned to France at the end of the year, settling in Argenteuil, a village on the Seine near Paris. The next year he painted Impression, Sunrise (depicting Le Havre) which was shown in the first Impressionist exhibition in 1874. When critics used the title to deride him for his ‘impressionism’, he and his colleagues adopted the term as the name for their movement. Pierre-Auguste Renoir (1841-1919) During the Commune some Communards found Renoir painting on the banks of the River Seine, thought he was a spy and were about to throw him into the river when one of the most bloodthirsty leaders of the Commune, Raoul Rigault, recognized Renoir as the man who had protected him on an earlier occasion. Rigault intervened and vouched for him. By this slender thread, Renoir was saved to go on to become one of the giants of Impressionism. Paul Verlaine (1844-96) At the proclamation of the Third Republic the poet Verlaine joined the 160th battalion of the Garde Nationale, turning Communard on 18 March 1871. He became Head of the Press Bureau of the Central Committee of the Paris Commune. He escaped the deadly street fighting and went into hiding in the Pas-de-Calais. Verlaine returned to Paris in August 1871 and, in September, received the first letter from Arthur Rimbaud with whom he was to have his passionate and ill-fated affair. Guy de Maupassant (1850-93) On the outbreak of war, 19-year-old Maupassant abandoned his law studies to volunteer for the army. He served first as a private in the field, and was later transferred through his father’s intervention to the quartermaster corps. Many of the short stories he published throughout the 1880s describe brutal or haunting episodes in the war.